I love candy-grams and use them many times instead of the regular cards - it is much more special and it is (of course) sweet. I made this candy-gram for my boyfriend for our first anniversary together and he loved it (well - not as much as I loved his present... He proposed to me!!!). but some SMARTIES convinced me to give you a shot. but when we look back on it, we SNICKER(s). because it was for your ex. No one could make me as HAPPY as you. Join in and write your own page! It's easy to do. How? Simply click here to return to candy bar cards. 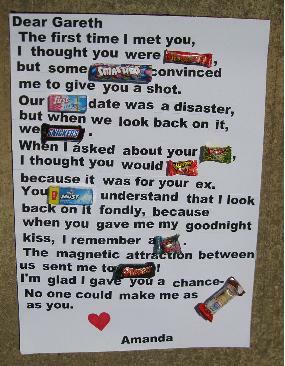 I made this candy bar card for Sam, my boyfriend for our 6 month anniversary. I hang it on his dorm room door (we're in college) and when he left his room he saw it - he was surprised (and a little embarrassed... yes - my Sam is a bit shy). It was one of many little surprises that I had planned for him. after a big BLOW-UP. It is all my hot air. Next time just give me a TIC TAC. I'll never see you as SOUR. all goodness inside and out. 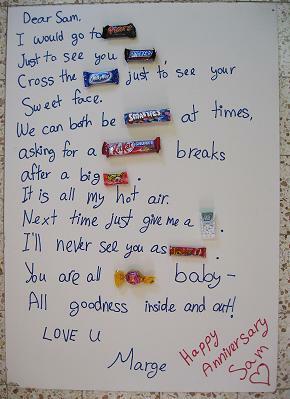 I made this candy bar card for my boyfriend on his 20th birthday. Sorry - I didn't make a photo of it :0( but it was a great success - he totally loved it! You make my heart go BOOM when I am near you. It feels like it is going to BLOW-UP and out of my chest. You light me on fire and make me HAPPY. When I love you all the way to MARS and back. Our love is never SOUR. I couldn't find someone as hot as you if I searched the MILKY WAY. You make me so very HAPPY, my love. I will call you my little KITTY-KAT. When I met you it was love at FIRST sight. For your birthday I'm getting your name as a TATOO. Love u to the moon and back. I love your site and I took the candy bar card idea from it.